In this article you will learn how to move the toolbar's popup element of RadEditor to a different location on the page when ToolbarMode is set to ShowOnFocus. Wrap the DOM element that needs to be visible and RadEditor in an element with position: relative style. And use the RadWindow moveTo() method to reposition the popup based on the relative parent's position by considering the popup hight from step 6. Figure 1: The result from the code in Example 1. 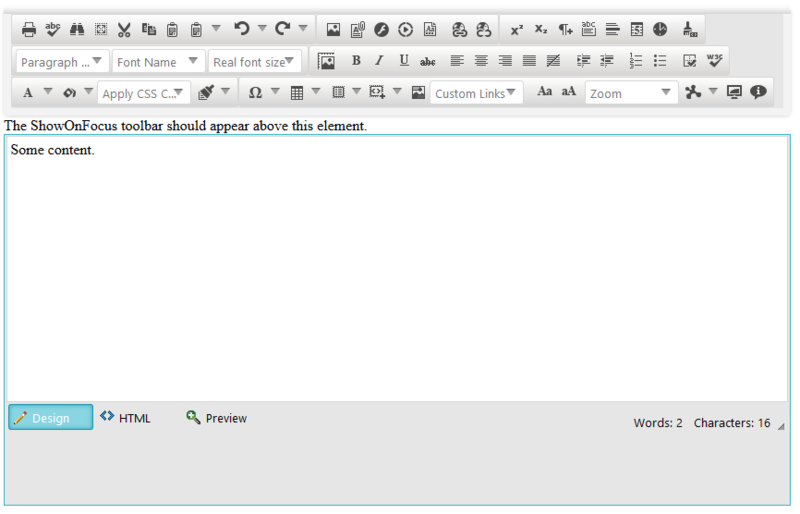 Example 1: Move ShowOnFocus toolbar of RadEditor based on a relative parent. <telerik:RadEditor RenderMode="Lightweight" ID="RadEditor1" runat="server" ToolbarMode="ShowOnFocus"